I've taken the liberty to copy a photograph of a painting I found on the internet to share with you. It is by local artist Jane Grover. It's a beautiful depiction of this magical evening. In addition, I'm going to share with you the description of this celebration, taken directly from the Taos Visitors Guide on line. While Christmas is still a few days ahead, I send you my greetings now for a safe and loving holiday! In the northern villages of New Mexico, ritual re-enactments of history by the Hispanic community — combined with medieval morality plays known as autos sacramentales brought to the area during the Spanish conquest — are faithfully re-created in distinctive Christmas celebrations. At the Indian pueblos, Catholicism is intertwined with ancient American Indian beliefs. When the Spanish arrived in New Mexico in the 16th century, missionaries assigned a patron saint to each pueblo in an effort to convert tribal members to Catholicism. Because tribal rituals coincided with the saints’ days, these religions eventually merged. A Taos Pueblo spokesman says that a large percentage of tribal members are baptized Catholic and that the church service is much like Catholic services elsewhere. The only difference, he says, is that the motifs in the chapel have native elements and tribal members wear blankets and moccasins. On Christmas Eve, the northern pueblos celebrate this most important Christian holy day in a distinctive Indian way. 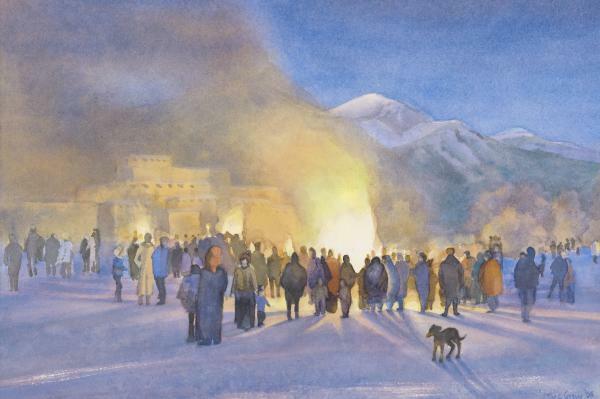 Most moving are the vespers with bonfires and the procession of the Virgin Mary at the 1,000-year-old Taos Pueblo— a UNESCO World Heritage site. The drama of the event unfolds at the foot of the Sangre de Cristo mountains, amid the orange and purple hues of a winter sunset. At sundown at the pueblo’s San Geronimo chapel, the archbishop of Santa Fe presides over vespers. As the sky darkens to a deep blue, torches are lit, and families build huge bonfires of ocote pine in the main plaza. Orange flames illuminate the night sky, shooting up spires of smoke. Other smaller bonfires are scattered throughout the plaza and in front of homes. Residents gather on rooftops covered in snow. At the end of vespers, the chapel bells peal. The archbishop and acolytes lead a procession out of the tiny chapel, followed by six men carrying a dais that holds the statue of the Virgin Mary under a billowing canopy. At the front of the procession, pueblo men carrying rifles shoot live ammunition into the air to announce her arrival. Drummers and members of the church choir follow, and the throngs of people there for the bonfires join in the procession. The beauty, mystery and power of the scene are profound. The Taos Pueblo Community extends a warm welcome to their Taos neighbors and to all friends of the Pueblo. sounds lovely. have a wonderful christmas martie - lots to celebrate! We were recently reminiscing about the bonfires at Taos Pueblo - the colors, the smells, the sounds. Thanks for sharing this painting. Do you have our snow?? ?